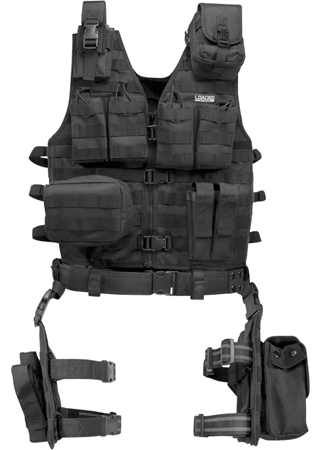 The VX-100 vest helps keep tactical essentials in order and close at hand. It is fully adjustable to fit most adult body types, adjustable shoulder panels and side straps for a custom fit. This tactical vest features ladder buckles on each side of the vest allow for quicker adjustment for a customized fit. The 1-inch heavy duty front webbing system allows for easy re-configure all pouches and 1-inch heavy duty back webbing system to carry additional gear. It's front and back velcro areas are for attaching ID patches, reinforced rescue pull handle located on the upper back of vest is for dragging injured personnel out of harm's way, and it's d-rings located on either shoulder for attaching additional accessories or a sling harness. Interior back features a tough mesh pocket, designed for maximum ventilation and durability. Length : 20.5" x 27.5" x 28.50"